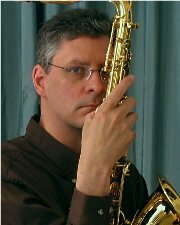 Guy Chamberlin earned a Master of Music Education degree from the University of Arizona (Tucson) where he studied saxophone with Elizabeth Ervin, and arranging and conducting with John Boyd. He received a Bachelor of Music Education degree at Illinois State University (Normal) studying saxophone with James Boitos and conducting with John Farrell. Guy is a tenor saxophonist with the Illinois Valley Saxophone Quartet. He was a member of the John Sibbing Saxophone Quintet. He is a tenor saxophonist, but has extensive experience on baritone sax. He is an arranger and publisher of works for saxophone quartet, wind ensemble, solos, and a band-choir piece. Guy Chamberlin was an arranger and instructor for the Guardsmen Drum and Bugle Corps. He marched with the Geneseo Knights Drum and Bugle Corps. Chamberlin has been teaching music and band in Illinois since 1988. He is a graduate of Palatine High School.